Graffiti is art to some and repulsive to many. It divides people, cities and societies, with its often political and cultural anarchism. An army of thousands, graffiti artists constantly re-design the urban landscape. For me graffiti is an art form for the modern world, with masters like Banksy and Invader whose works have both brilliance and beauty. However, the many ruin it for the few, with pathetic pre-teens scribbling their gang names throughout urban areas like a dog urinating on a tree to mark it’s territory. Graffiti has the incredible power to be funny in a plethora of ways. In Rome someone had stencilled a huge and elaborate Carp fish and next to it someone else had sprawled in untidy and dripping writing ‘Diem’. If you don’t get it shame on you and Google Carpe Diem. Another brilliant example of graffitied humour, perhaps by mistake was in Durham. Someone had sprayed ‘f**k iPods’ on a back entrance wall of a supermarket. Not f**k Apple as a company but f**k the specific product they create. So it was either a political and technological poke at the iPod or simply some numpty with no clue what to f**k. However, what I find the funniest is the multitude of love notes like ‘KC 4 GW 4EVA’ in every public toilet or scratched into trees. You know that if they can’t spell forever it’s just not going to last that long and soon it will be changed to ‘KC 4 GW 4EVA till she slept with that bloke from work’. The Invader’s graffiti art is one of my favourites because it’s simple in its design but brilliant in its virus like expansion. 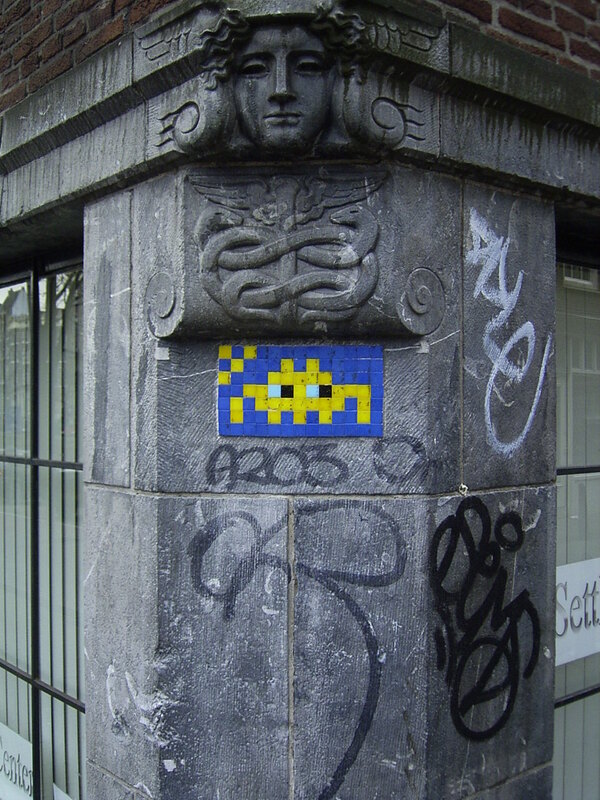 Invader is a French artist who pastes up small colour mosaics to create characters from the game Space Invaders. It began in the 1990s and since then it has spread from its origins in Paris to the rest of the world in countries like Nepal, Australia, America and Japan. The reason I think its so resplendent is it’s bright colours set on the background of dark stoned buildings dotted around cities, I find it really uplifting. Banksy for me is the sovereign of spray can humour, a quote from his book Wall and Peace sums up graffiti as an art “Despite what they say graffiti is not the lowest form of art. Although you might have to creep about at night and lie to your mum it’s actually one of the more honest art forms available. There is no elitism of hype, it exhibits on the best walls a town has to offer and nobody is put off by the prices of admissions.” His genius stencil art is always funny and often carries with it a culturally poignant undertone. Banksy’s most risky pieces were the ones he stencilled on the Segregation Wall in Palestine; he drew windows with views and ladders to highlight the prison like walls that had been created. I urge you to look at Banksy’s collection online here as it is incredible. Have I ever done graffiti? Yes, once and for me it sums up what graffiti is. I was about to leave university and I wrote under the desk a very simple and clear instruction “Never forget me – James Dunn 2010”. For the most part that defines what graffiti is, an attempt to be remembered through etched on words. The acts of vandalism are essentially acts of self-preservation, whether it be the anonymous guy who writes dirty jokes in public toilets or people like Banksy, whose name (even though it is a pseudonym) is legendary. In the end they are all just trying to be remembered, immortalised through words and colours. “I hate graffiti, spaghetti and all italian food” ~ On a bandstand in Wimbledon.